Did Eminem Create Fake Pharmaceutical Ads To Promote His New Album? Yesterday, Eminem’s manager, Paul Rosenberg, posted a photo of a new CD from Shady Records artist Yelawolf to Instagram (see below). Eminem fans noticed something unusual in the background of the photo: a conspicuous pharmaceutical billboard for something called Revival. The advertisement’s backwards ‘E’ seems to allude to Eminem’s preferred typographic treatment of his name. Furthermore, the name Revival seems to fit into a naming convention Eminem has used for albums including Relapse and Recovery. The billboard lead fans to a ‘Revival’ website, which is loaded with Eminem allusions. 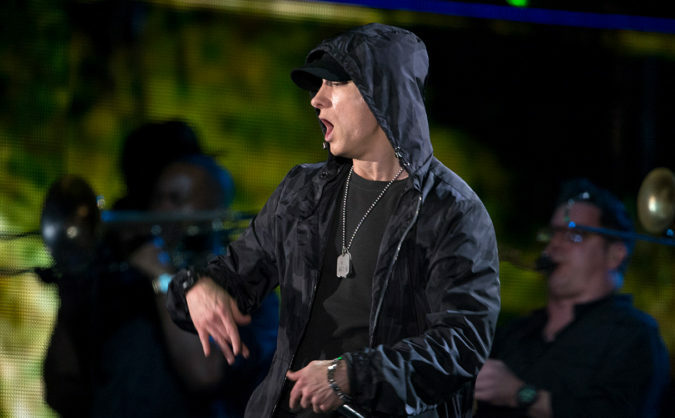 A video on the site includes the dialogue “it’s easy to lose yourself,” which is likely a reference to Eminem’s hit ‘Lose Yourself.’ Symptoms like “sweaty palms” refer to the same song. Savvy Reddit sleuths found an advertising directory that confirms that the ad campaign was purchased by Eminem’s label, Interscope Records. A phone number on the site includes a recording with similar slightly skewed pharmaceutical information. The melody of the song ‘I Need A Doctor’ (by Dr. Dre, Eminem and Skylar Grey) plays in the background. All signs point to Eminem in this extremely clever ad campaign. Further news about Revival seems imminent.